No, those jet streams are not directions from our alien overlords. An April Fool’s Day prank by SpaceX and Tesla founder Elon Musk went off the rails last week when Musk suggested the streams of fog trailing jets were aliens offering directions on teleporting. We’re here to say: No, that’s not true. “Chemtrails” is actually just a play on contrails, the white stuff that lingers after a plane flies by (condensation trails, get it?). Conspiracy theorists concocted the idea that contrails were actually a geoengineering scheme to release aerosols into the atmosphere to shield the planet from incoming solar radiation and reduce the effects of climate change. Others believe aerosols are harmful chemicals that are slowly contaminating our food and water, perhaps even causing brain damage. But science comes to the rescue by debunking the idea of chemtrails. 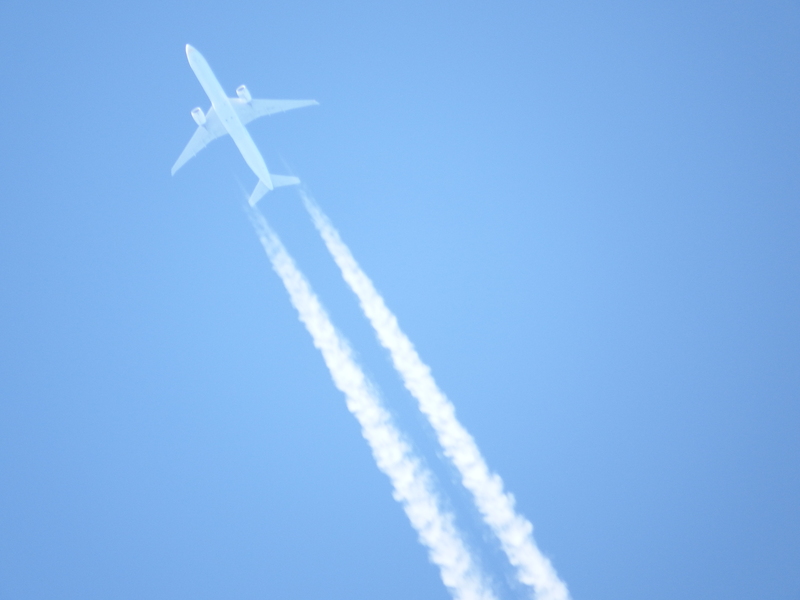 Contrails are caused by condensation built up within jet engines. As they reach higher, colder, and wetter altitudes, they leave behind a cloud, much like exhaling warm breath on a cold winter day. And the wetter the atmosphere is, the longer the contrail sticks around. It’s a common misconception that contrails immediately dissipate, or at least, they used to. Historical records show that the streams were in the sky long before our generation, but there wasn’t enough atmospheric science to understand them. In a 2005 article, scientists from the Institute for Atmospheric Physics in Germany found that not only are contrails persistent in colder, more humid climates, they may actually also be contributing to the warming of the atmosphere — defeating the whole idea of chemtrails reducing climate change. Though contrails are generally seen in cooler climates, Earth’s atmosphere can get surprisingly chilly. A British study from 2012 explored contrails at different altitudes to see if height played a role in their creation. What they concluded was that flying higher does not produce fewer contrails, no matter what region you’re in. And even in arid regions, they can persist: In Los Angeles — where contrails are rare — there is an entire time period known as “contrail season,” when for a few short weeks there’s enough moisture in the air for planes to produce them. Sure, contrails create a grid, not because of a greater alien conspiracy but rather because there is a constant stream of flights crisscrossing the sky at different altitudes (see below). Contrails may also appear curved because, well, the earth is not flat. American Airlines Flight Map Across the U.S. Some conspiracy theorists believe that contrails contain aluminum, barium, strontium, and other bits of radioactive materials that could be causing a wide range of diseases like cancer, infections, and even brain damage. While jet engines do emit soot, the science doesn’t quite add up. For one thing, aluminum is everywhere. It makes up 7.5 percent of Earth’s crust and there are trace amounts in water, food, even our bodies — it’s a naturally occurring element. As for areas that have high levels of aluminum? The root cause is much more likely to be drilling and mining operations. In locations with acid mine drainage, for example, there can be toxic levels of several metals, including aluminum. In a 2001 report, the Tennessee Valley Authority inspected the mineralogy of three wetlands and found that the wetlands had high levels of aluminum in both the water and plants. Contrails are actually destructive to the environment, but not in the ways that conspiracy theorists suggest — and they’re definitely not encoded messages from aliens, either.